Charlotte Nicoll was my 4x great-grandmother and wife of William Duff Sr. 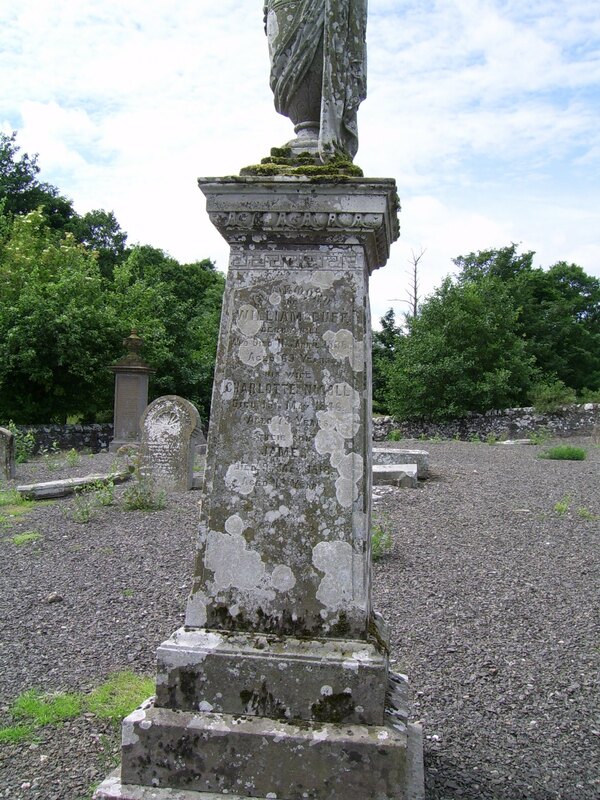 I knew from her gravestone in the Kirkstyle Cemetery in Perthshire, Scotland that she had been born 20 Sept 1766 and had died at Berryhill, the Duff Family Farm, on 15 May 1846. 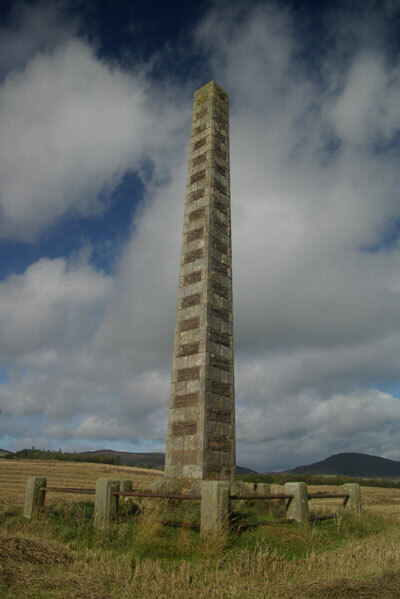 It’s a 50-foot high stone obelisk that’s to honor Robert Nicoll (1814-1837), who was a poet who grew up on the farm called Tulliebelton (also spelled “Tullybelton”), just down the road from Berryhill. Given his age and name, I thought there was a very good chance that Robert was a nephew or cousin of my grandmother Charlotte Nicoll. We know Charlotte’s father was named Robert Nicoll and that she had a sister named Margaret who married Robert Duff (her husband’s brother). This rather lengthy bio of the poet is very good: http://gerald-massey.org.uk/nicoll/. There is also an article about the monument itself here. I decided to do some looking into the Tulliebelton Nicoll family and found some great results. 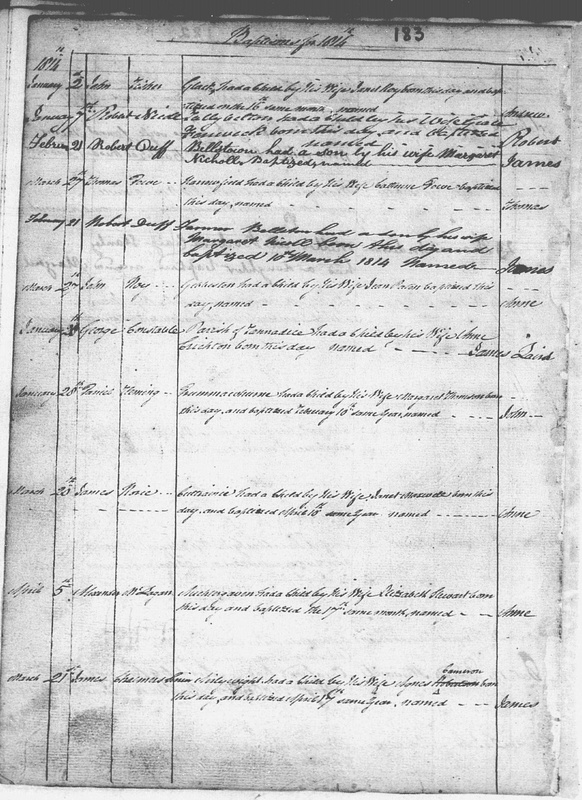 and the big discovery was the attached record for my grandmother Charlotte Nicoll, who was born 20 Sept 1766 at Tulliebelton! 20 Sept 1766. To Robert Nicol, miln of Tullibelton (sic), a daughter Charlott (sic). So we now know that the Charlotte Nicoll lived, literally, on the next farm over from Berryhill, and that she was almost certainly related to the poet. I’m not sure exactly how yet, but it seems likely he was her nephew. 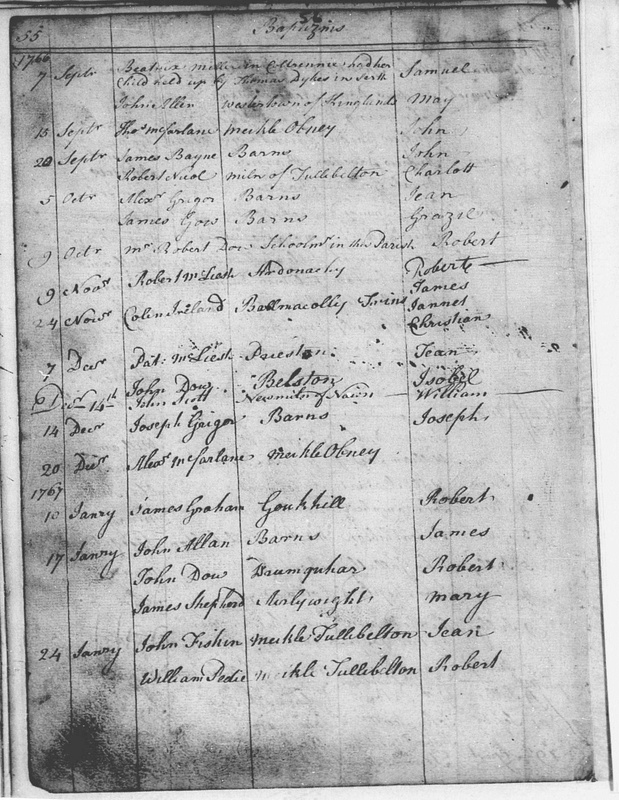 The birth record for Robert is attached (you can see two children for Robert Duff and Margaret Nicoll are listed there also). The poet Robert Nicoll’s parents were Robert Nicoll and Grace Fenwick, also of Tulliebelton. I’m guessing there was another boy, Robert, born to Robert and Jean above who is the missing link. The poet’s father seems to have been born about 1774, so he was perhaps born between Katherine and Jean Nicoll listed above. Robert and Grace had a son named “Charles Duff Nicoll”, so one can see that the two families were close. Berryhill Farm (also spelled “Berriehill”) was the Duff Family farm in Auchtergaven Parish, Perthshire, Scotland. The farm was said by James Ritchie to have been in the Duff family since a least 1688, probably earlier. 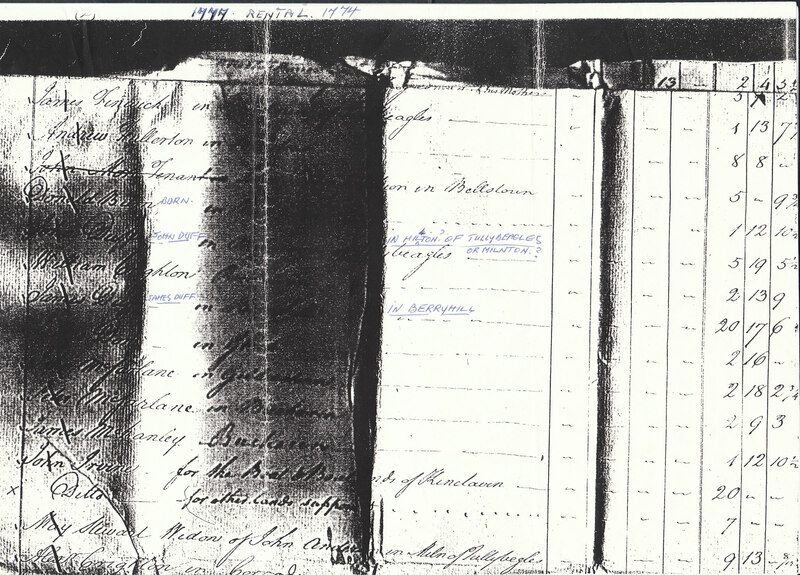 My cousin Noeline has sent me some related documents which were sent to her by by Norman Pannell of Christchurch, NZ. in 1988. 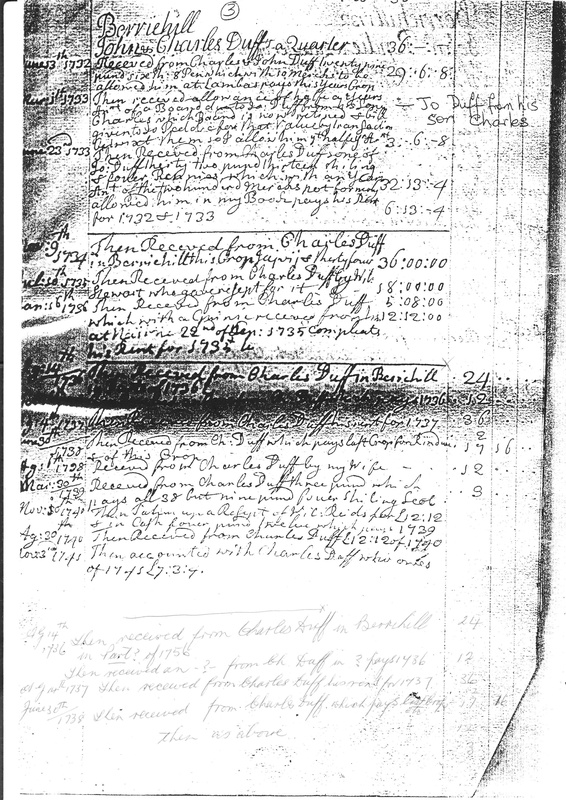 One of these xeroxed documents is a listing of rent payments made on “Berriehill” by John Duff (my 7x great-grandfather) and his son Charles (my 6x great-grandfather). The payments go from 1732 through 1741. Charles’s son James Duff Sr., my 5x-great-grandfather, was the oldest Duff for whom I had documentation until receiving this document. Receved from Charles Duff by my wife 12 [pounds]. Then taken up a resept of Wil. Reids for 12 [pounds]: 12 and in cash four pound twelve which pays 1739. Then receved from Charles Duff 12 pounds 12 of 1740. Then accounted with Charles Duff who owes of 1741 7 [pounds], 3:4. This document is a rental document for Berryhill in 1777. You can see Charles Duff’s son James was the proprietor of the farm at that point. 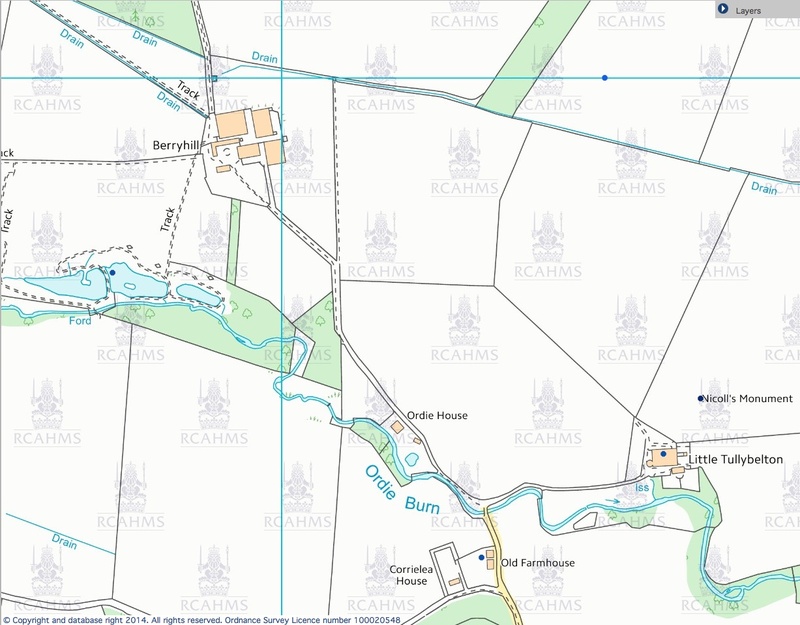 Also mentioned on the same document is Bellstown farm which would later be run by Robert Duff, and Miln of Tulliebelton, which was the farm where the Nicoll family lived.